Classic Film and TV Café: Man vs. Machine in Fritz Lang's "Metropolis"
The Metropolis is a huge, expansive city with skyscrapers and elevated railways. This is where the rich live lavishly and play in beautiful gardens, carefree and content. Well below where the wealthy reside is the “workers’ city,” where laborers work long, hard hours to maintain the city above them. Fredersen (Alfred Abel), “Master of Metropolis,” runs the city with cold determination. His son, Freder (Gustav Fröhlich), enjoys his buoyant lifestyle, but one day, he follows a young woman to where the workers work underground. Horrified by an accident which leaves a number of laborers deceased, Freder hurriedly tells his father what he has witnessed. Fredersen, however, is upset that he’s been informed of the incident by his son (in lieu of an employee) and is more concerned with “plans” that a foreman discovered on two of the dead workers. The papers found are actually maps to a place in the city’s catacombs, where workers congregate to listen to Maria (Brigitte Helm), the woman with whom Freder has become obsessed. Meanwhile, Freder returns to the workers’ city and swaps places with one of the laborers. As Maria tells the workers that a “Mediator” will essentially be the savior and establish balance between the planners and the laborers, Freder believes that he is to be the Mediator. Fredersen convinces inventor/scientist Rotwang (Rudolf Klein-Rogge) to make his Maschinenmensch (“machine-man”) in the likeness of Maria, to instill doubt among the workers’ faith in the woman. Rotwang, however, has a sinister purpose, as he and Fredersen were once in love with the same woman, who married Fredersen and died giving birth to Freder. Rotwang sends the Maria-machine to spark a revolution among the laborers, hoping to destroy Metropolis and murder Fredersen’s son. 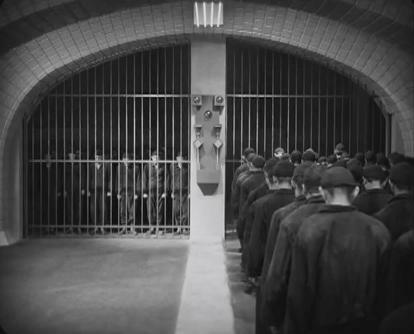 One of the most significant qualities of Fritz Lang’s 1927 silent film, Metropolis, is a bleak view of capitalism. It is doubtless from the beginning that the extravagant metropolis could not exist without the work of the men below. These are not men who go into work each day, heads held high. In fact, they literally hang their heads and hide their faces, a slow march to and from work. The movie opens with a shift change, and the audience follows the men unto what looks to be a freight elevator and leisurely descends into the depths of the city. The workers appear to be on their way to prison, which, in many respects, they are. After one of Fredersen’s men is fired, Freder rushes to the man’s side and stops him from putting a bullet into his head. Such an act implies that, without employment, however burdensome, death is the only viable option. A common fear that is frequently expressed in sci-fi films (e.g., James Cameron’s Terminator series) is a general uneasiness of machines taking over the world. Metropolis makes such a somber concept even darker with a man who intentionally creates a machine to destroy his own kind. And in the end, potential destruction is not at the hands of the machines, but the hands of the men, as the Maschinenmensch is instructed to coerce the workers into destroying themselves. This coincides with an image Freder has following the accident, one of Moloch, a machine to which the laborers are sacrificed. It’s a frightening idea not just because of the implication of men working to their deaths, but, in Freder’s vision, the men willingly walk up the steps into the mouth of Moloch. There are men vs. machine comparisons throughout Metropolis. In addition to the Maria and Maschinenmensch duality, the men, in the process of labor, are staged and choreographed to look like machines. Their movements are sharp and precise and, most notably, monotonous, to the point where, if watched long enough, the men will truly resemble machinery. This goes back to an appraisal of capitalism, in that the political ideal is not a construction of equality, but a hierarchy, with the wealthy high in the sky and the laborers nothing more than cogs in the machinery. Klein-Rogge is the titular doctor of Lang’s Dr. Mabuse films (1922 and 1933), the first film which also featured his Metropolis co-star, Abel. Although she is completely unrecognizable, actress Helm was actually playing the part of the Maschinenmensch. There are various prints of Metropolis with multiple running times. 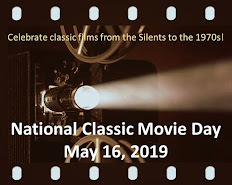 This is partly due to some of the footage reportedly being lost after its premiere in Germany, but also from the speed of the frame rate (or frames per second), long a source of debate among film historians and enthusiasts. Metropolis is a much loved sci-fi classic, and deservedly so. When the film was released in 1927, the year of the movie’s setting, 2026, was nearly a century away. 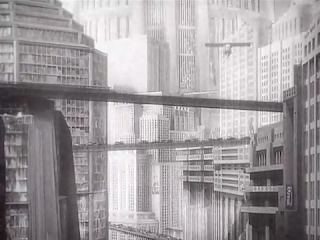 Now, in 2010, we are much closer to the time of Metropolis, and the film’s impact has not diminished in the slightest. It’s an expression of societal classes that can be applied to what is happening in the present, as well as a fear that may still lurk in our hearts today. You are a goldmine of good writing this month, Sark, with your insightful article about Blade Runner and now Metropolis, one of my favorite movies. The scenes of the workers at their posts are horrifying, and make a day at the office look like a picnic. But it isn't a picnic most of the time, is it? It's the same kind of machine-like activity, especially with computers now. Human beings weren't meant to sit in front of screens all day doing the monotonous work so many of us do. Metropolis is a brilliant comment on what rampant capitalism can do to people. It's warnings for the future are similar to Orwell's "1984". So many of the aspects of that movie and his novel have come true with a vengeance. For some reason, in the early films, the Germans created more masterpieces of this type than we did, and Fritz Lang, along with F.W. Murnau, showed incredible creativity in their work. Thanks for writing this review on Metropolis -- you really did it justice! Sark, I have never heard of this film. I did however, enjoy reading your awesome review! Also, loved the beautiful pictures you posted. Sark, you've done an amazing job this week of discussing two sci classics--METROPOLIS and BLADE RUNNER--that present a dark, despairing view of Earth in the future. And yet, there is still hope for mankind in both of these worlds. 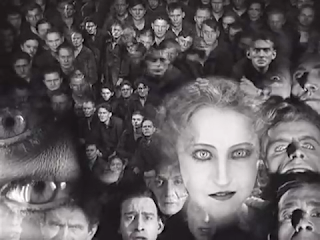 Your insight on the man vs. machine theme is splendid (hey, if I was still taking college film classes, it'd be tempting to do a comparison of METROPOLIS and TERMINATOR...love how you connected them). As Dawn said, your photos from Lang's film are priceless. I think set design contributes greatly to the film's overall impact. In the photo you included of the city, one can see how cluttered it looks. Its almost like the skyscapers form the walls of a huge prison cell, which supports your brilliant analogy. While I have always admired METROPOLIS, it's not one of my favorite Lang films (I prefer M and SPIES among his early works). However, your thought-provoking essay has inspired to dust off my copy of the movie and watch it again! 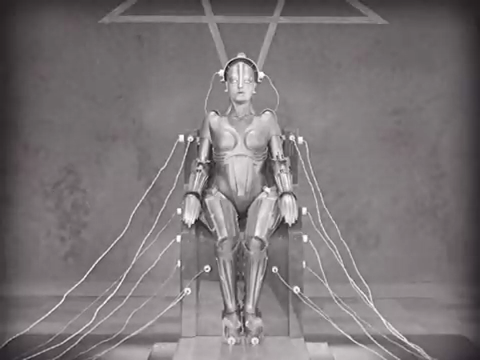 Magnificent review of "Metropolis," Sark! I haven't seen this for many years but your insightful review brought back a clear memory of this. As I was reading I was particularly taken with the religious imagery of the film. Moloch (Molech) is referenced in Acts 7 and Leviticus and I Kings and II Kings as the god to whom the Ammonites willingly sacrificed their children in a horrible way. Maria seems to be a reference to the Virgin Mother of Christ who is the Savior and the Mediator between God and man. Your photos were awesome, too. Great job!